In UNIGINE all the opaque geometry is rendered in the deferred rendering pass. 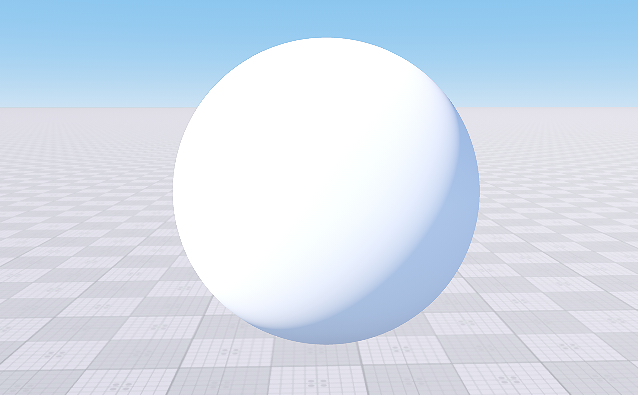 This article explains how to create your own material with shaders (both vertex and fragment) for the deferred rendering pass. In this article, we create a material for static, dynamic and skinned meshes. We define a heightmap for the vertex shader and an albedo texture for the fragment shader. Also, we calculate normals to ensure proper lighting for our mesh. The material is the essential thing for rendering: you specify shaders, states, bindings, textures in the material, thus, telling the engine how to render it. In your project folder open the assets/Materials folder. We defined a new custom_mesh_material base material with the deferred state. Also we defined shaders (fragment and vertex) for the deferred pass and set the paths to them (we will create both these shader files and a folder in the following sections). Finally, we defined the bindings: types of meshes for which the material can be assigned. In this section we explain how to create the structure for shaders and how to create the custom vertex shader. Create the shaders folder in your project's assets folder. Inside the recently created folder, create another two folders: vertex for vertex shaders, fragment for fragment shaders. Define the input vertex data structure. Define the output vertex data structure. Translate the object-space coordinates to clipping space coordinates. Save the shader file with the deferred.vert name and extension inside the assets/shaders/vertex folder. This section contains instructions on how to create a fragment shader (also known as pixel shader). We include the UUSL header for fragment shaders. Define the input fragment data struct (where we receive the data from output structure of the vertex shader). Start the main program of the shader, where we create a GBuffer instance for metalness workflow and set it. Save the shader file with the deferred.frag name and extension to the assets/shaders/fragment folder. Launch your project in editor mode (or open your world by using UnigineEditor). UnigineEditor will create all necessary .asset files and necessary resources in the data folder. Open the Materials Hierarchy window. You will see the recently created base material in the list of materials. Assign the created material to the material ball by dragging it to the object. Or create a primitive (e.g., a sphere) and assign the material to the primitive. It doesn't look good, but it works. Let's go further and calculate the tangent basis for the mesh and assign textures to it. Let's add textures to the both shaders: vertex and fragment. In the vertex shader we will use texture as a heightmap and in the fragment as a albedo map. First, let's edit our custom base material and add two texture slots. 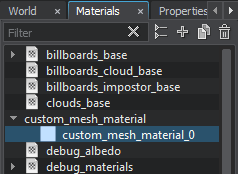 Open the custom_mesh_material.basemat file from the assets/Materials folder by using plain text editor. Now the textures will be available for the shaders. We specified the name of the texture, rendering pass, and the path to the default texture. Now we should edit the vertex shader code and add the texture to the shader. Open the vertex shader deferred.vert file in the assets/shaders/vertex folder by using plain text editor. That's it! Our vertex shader now calculates the normals, gets the texture and performs the displacement mapping. We've added three new output semantics and now we should receive them in our fragment shader. 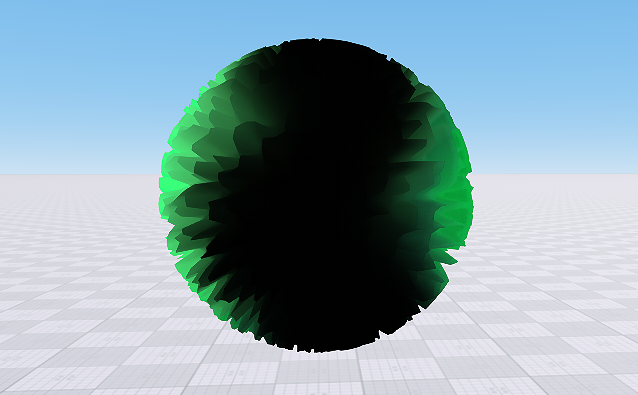 Now we should edit the fragment shader code and add the albedo texture to the shader. Open the fragment shader deferred.frag file in the assets/shaders/fragment folder by using plain text editor. Now our shaders are ready to work! Let's see them in action! We've changed our shaders, so we should reload them by using the shaders_reload console command. Open the console and execute the shaders_reload command. Inherit a material from your custom base material (a child material named custom_mesh_material_0 will be created). 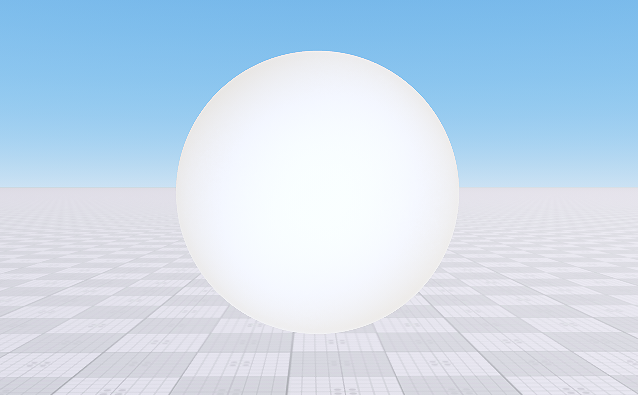 Assign the created child material custom_mesh_material_0 to the sphere by dragging it to the object. 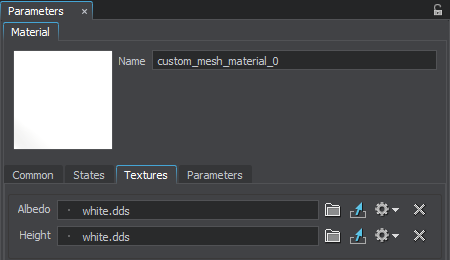 Go to the textures tab of the material in the Parameters window. Choose the albedo and the displacement maps for the material. Voila! We just created a new deferred material with own shaders which uses two textures for albedo and displacement mapping!